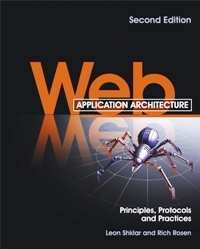 Web Application Architecture: Principles, Protocols, and Practices is a textbook for the aspiring Web application developer. It runs the gamut of Web technology: the protocols, the markup languages, and the best practices associated with the development of solid, extensible Web applications. For tutorial purposes, two sample Web applications are designed and implemented, one in Struts and one in Ruby on Rails, with the source code and installation instructions for both available here on this site. The table of contents is available for download from Wiley's web site. If you are an instructor at an accredited institution and wish to consider this book for classroom use, you can request an evaluation copy from Wiley.